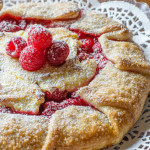 Raspberry Cheesecake Galette - What the Forks for Dinner? Even though it is far from raspberry season and they were kinda pricey …..I had a hanker’n for something raspberry. 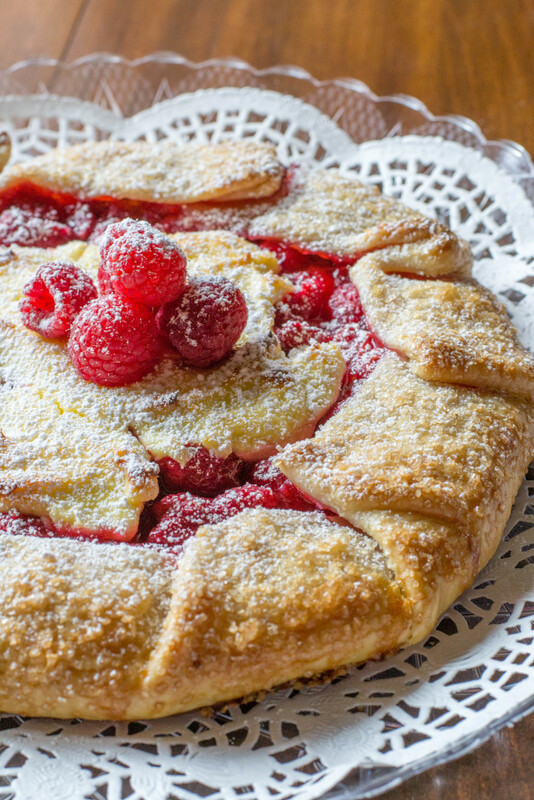 Raspberry Cheesecake Galette. Kinda like pie, kinda like cheesecake, and totally delicious! My idea with these was to make them small……..individual size, but I had a huge fail with that. They fell apart and were like little pancakes…….it really was a sight. So plan B…….. make it big. Not that its a huge dessert, but it is not the cute little baby galettes I had visions of. Making it plan B size was easier and in the long run I think a more show stopping dessert, especially if you are trying to impress. And really isn’t that what all food bloggers want to do….impress you, our loyal fans? As I alway say, I can not make a pie crust, I wish my Mom was still here to show me, her’s were the bomb. So, I do what every self respecting non pie making gal does…….I bought the pre-made! 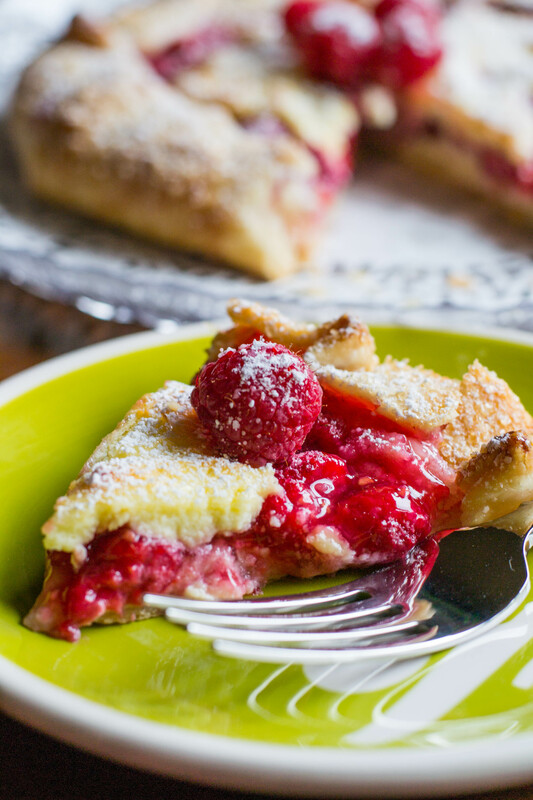 The raspberries are gently mixed with sugar, lemon juice, cornstarch, a pinch of salt and a touch of almond extract. Cream cheese, egg, and sugar make up the filling. 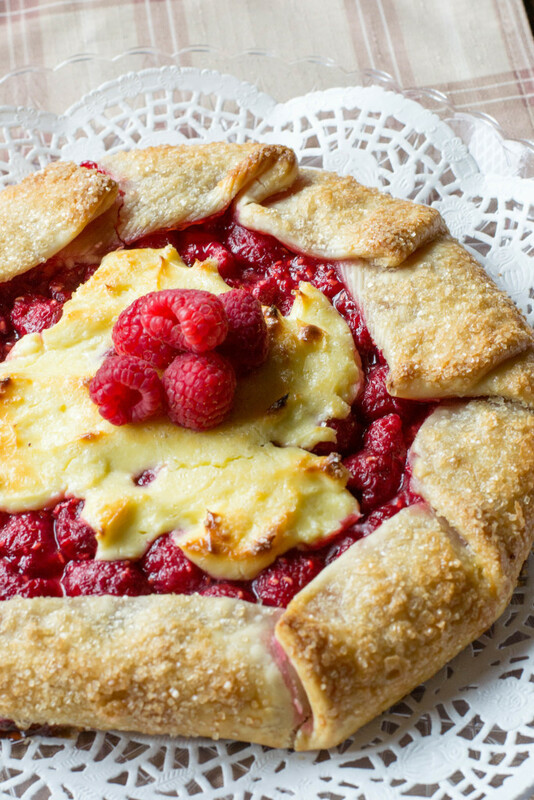 A little cheesecake filing on the bottom, raspberries, fold over the pie crust, no certain way, just so the raspberries can’t get out. Then top with the rest of the cheesecake filling. Make sure to let some of the berries show. My favorite finishing touch to a pie is and egg wash (1 egg beaten with about 1 tablespoon water), then brushed over the crust and for an extra crunch of sugar use turbinado sugar, its just perfect. Bake for 20 to 25 minutes and allow to cool. Some of my pictures have powdered sugar and some don’t. It’s pretty either way and I wanted to show versatility. 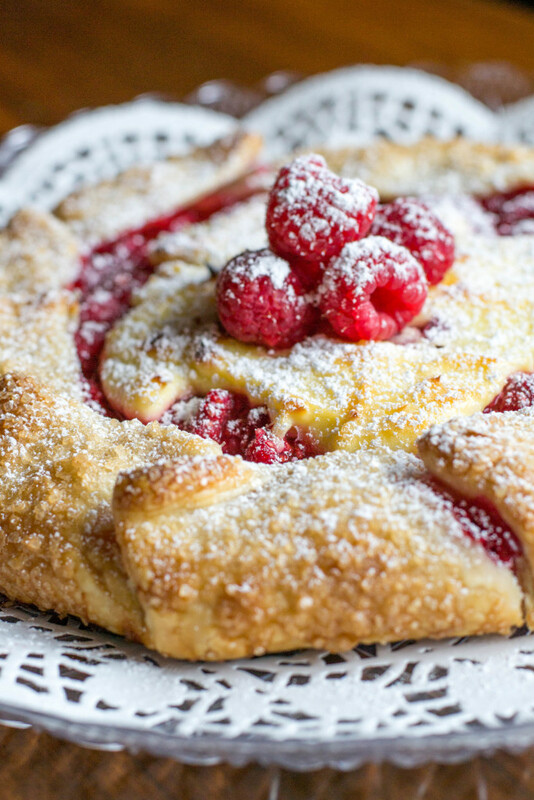 For a pretty, easy, fanciful dessert try Raspberry Cheesecake Galette. Unroll the refrigerated pie crust and place on a parchment lined baking sheet. Refrigerate until ready to use. For the raspberry filling, in a medium bowl, toss together the raspberries, ⅓ cup sugar, lemon juice, cornstarch,salt and almond extract. For cheesecake filling: with a hand mixer beat together cream cheese, egg yolk, and remaining 2 tablespoons of sugar. Spread half of the cheesecake mixture over the top of each pie crust, leaving about a 1 ½ inch border. 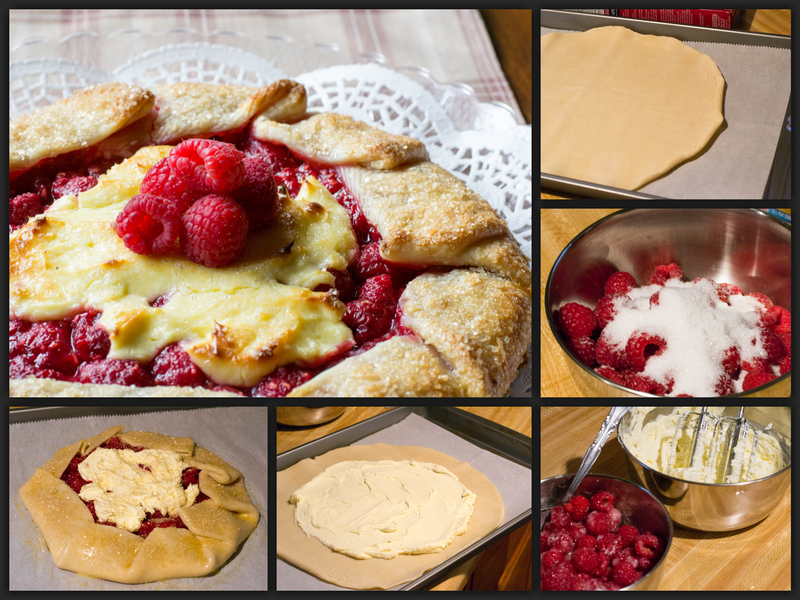 Top with raspberries mixture, and fold the edges of the crust over the raspberry filling. Scoop the rest of the cheesecake mixture over the top of the berries and spread slightly. Refrigerate for 30 minutes. Place an inverted cookie sheet in the lower third of your oven and preheat oven to 425. Brush the edges of the crust with a beaten egg and sprinkle with turbindao sugar. 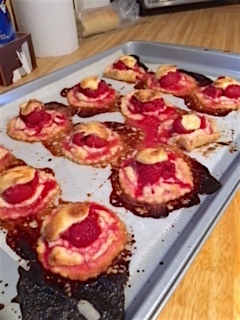 Place baking sheet with the raspberry cheesecake galette on it directly on top of the inverted cookie sheet. Bake for 20 to 25 minutes, or until crust is golden. Allow to cool slightly before slicing. Sprinkle with powdered for a pretty effect. * Turbinado sugar is a coarse raw sugar perfect for a sugary crunch. Made this for a work event and my co workers went crazy and ate the whole thing they loved it and told my dad and he wants the recipe! I did change the recipe slightly I did make my own pie dough (personally not a fan of store bought) came out great, I also added more sugar to the cream cheese mixture and some vanilla. Also I did not have almond extract so that was left out.